Here’s what a broken molar looks like in an Xray, and then the same tooth removed from the jaw and the pieces reassembled with red wax [clearly it could not be fixed so we surgically replaced it]. 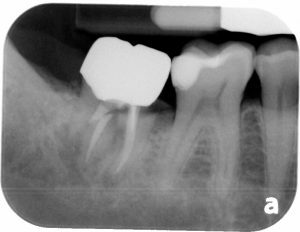 As best as we can tell, this was broken in this patient’s sleep while grinding his teeth. 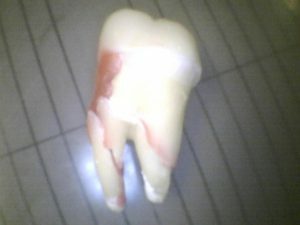 Tooth fracture and wear two of the main reasons why we want you to wear your night-guard if you are a tooth grinder!